This post from 2007 continues thoughts on Holy Space and its place in our lives. I am feeling my way forward with this post – that is to say – I have some thoughts that are probably still in formation – so bear with me. That human beings have a particular relationship with icons is, to me, part of the dogma of the Church. It is not an expressed dogma – the Seventh Ecumenical Council made its defense of icons dependent on the right understanding of the Incarnation of Christ. But we can move forward from there and acknowledge that the Incarnation of Christ is itself, in part, a revelation of what it is to be truly human. As Metropolitan Kallistos Ware says, “God became man so that man could become god, but He also became man so that man could become Man. And icons, as we understand from the Seventh Council, are possible because God truly became a man. To extend all of this a bit further – I would want to say that like the holy icons, space itself- the place we occupy at any given time – is deeply important to us as human beings. We are not disincarnate beings who have no relation to what is around us. We are quite the opposite – we are incarnate beings who are deeply defined and enmeshed in the space we inhabit. This space can mean any of the tangible elements of our existence: light, heat, color, space itself – and so many such things – all deeply important to us. I hope that what I’ve been writing seems completely obvious. Of course our environment and space are important. So what’s your point? The point is that we frequently act as though these things do not matter to us. I can speak only of the places I have been – thus, mostly America – but here, we frequently treat space as though it were not important – or as though it was only important for someuse and not for its relation to us as human beings. Thus we build ugly cities or build mindlessly, with consideration only for profit or some other less human purpose. To this day, it is relatively easy to spot a building built in the 1960’s or early 70’s. Go to anytown in your state and find the most silly looking building and you’ll probably be standing before some bright idea of those decades. It was a time where tradition played as little role as possible in the creation of space. I am not a student of architecture – but I know what makes me feel uncomfortable or out of place. Tradition has often created beautiful spaces for the simple reason that people prefer beauty to ugliness. Beauty is frequently destroyed either by ignorance, greed or just wrong ideology. But I do not mean to rant here about American architecture. My point is to write about the importance of space. There are reasons that Tradition properly guides the construction of Orthodox Churches – the building itself is an icon. Done well, the space in which we worship is an aid to prayer. Of course, this is not the same thing as saying every Church building has to be in competition with Hagia Sophia. But serious thought and care for such spaces remains important. You can pray anywhere. I have worshipped in a converted warehouse as an Orthodox Christian – and I would rather have been there than in a heterodox cathedral. Nevertheless, space remains important. 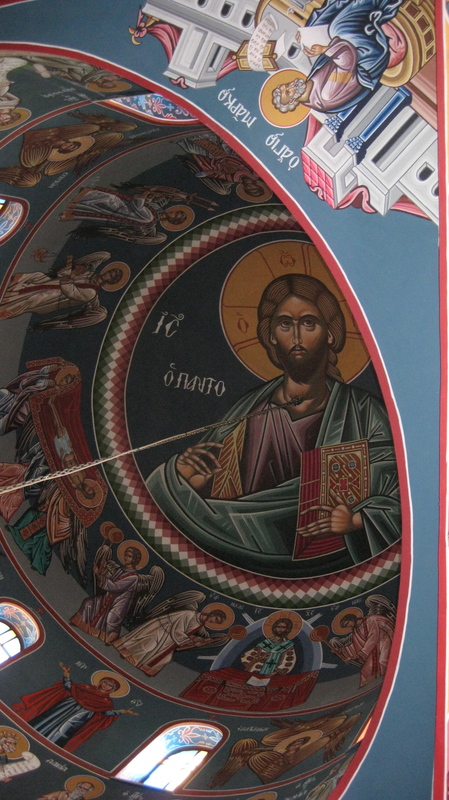 The small spaces in our homes, the “icon corner,” (in Russian it is the “beautiful” corner), are critically important and thus worth paying attention to. There is also the space we occupy in another sense – the place of our heart. It is deeply important for the heart to be “beautiful,” adorned with forgiveness and love. Without such beauty prayer becomes nearly impossible. I was with a friend earlier today who has just moved into a new house (“new” in the sense that it is “new” to him). There were things to see and admire (hardwood floors, nice views out the windows, etc.). But what he commented on most, and thus what led to this posting, were some of the house’s unusual places: a space under a stair, an unexpected corner – things that gave the house character and somehow made it a space well-suited for a family and a delight to children. At Theophany it is traditional for our homes to be blessed. But this same blessing continues as we pray and fill our spaces with the love of God. Perhaps in time our cities will become better spaces (some are already – I have my list – and, I suspect, you may have yours). With prayer, and attention to the fact that the spaces in which we dwell are places in which we incarnate the Christian faith, our spaces can be the garden of God, the space of Heaven. May God in His mercy grant us all such places to dwell. This entry was posted on January 19, 2010 at 5:40 pm and is filed under Orthodox Christianity. You can follow any responses to this entry through the RSS 2.0 feed. You can leave a response, or trackback from your own site. Thank you, Father, a good message. Before getting on the road to Orthodoxy, this “space” issue was something I began learning about (that our spaces are important; that it’s not frivolous to make our spaces warm and welcoming). Sometimes I think it’s a woman thing, but I know that’s not a complete thought. When we bought our current house all the walls, carpet, trim and ceilings in the main living areas were the same ice-light-bluish-green color. We spent several months living with that, and deep down I was disconcerted by it. Then we painted the main living space red, the dining room a rich brown, the kitchen gold and removed the carpet revealing a nice wooden floor. The change has been dramatic and now we love our cozy rooms. These days, in this vein, while I love our dear little mission, we meet in a rented house — I really enjoy going to the “mother” church in the next town over. It’s a beautiful Orthodox temple. A wonderful place to worship God. My son Ian today blessed his room rather more liberally, I’m willing to bet, than just about anyone in Orthodoxy. I brought home a lovely bottle of blessed water and set it in the icon corner on the floor – there was no shelf to put it on because the shelf was being painted. I warned Ian not to drink it all up, and he didn’t, but in due time he naturally crept into his room and poured the entire bottle out on the floor before his bed. Shame on me, I guess. But maybe the angel who, Ian assures me, has made his house in the closet will find the room more pleasant tonight. I had a post on a similar subject – the shape of heaven – in a different vein. WOW… what a new way to look at, even something as simple, as my house. We have our “iconic” wall but there are other special spaces of personal prayer and worship. I created a space in one of my daughter’s room for this as she really struggles with the idea of space. It was transforming for her. But beyond that, I’ve never considered this. What a way to even look at even the homes in which we live. I don’t mean riches or wealth but a manner of looking at the mundane chores as a way of honoring God with the beauty of “space.” Very thought-provoking. Your son is obviously coming along very fine! I think putting too much thought into space may lead to negative consequences, however. Look at neoplasticism/de stijl–it’s adherents had intellectualized space to the point that they wanted to destroy it. I suppose when it’s not for the glory of God, something bad is bound to come of it. This is a great post, Father Stephen. Sacred Spaces, by definition, have both an inner and an outer dimension. Such spaces are not widely known, in modernity.